Candles are typically our go to item for creating a dramatic and moody table for special occasions. Candles are a staple in our lives for a reason—they’re inexpensive, stylish, relaxing and make a fantastic addition to any room of your home. I suggest trying to pick something that you love (a color, a theme, or an item) and streamline your holiday home decor around it. Your holiday decor will appear more thought-out and really pop. Elevate your candle centerpieces to the next level by placing fresh cranberries in a glass vessel filled with water and let them float all night. Tall and skinny, short and plump or a simple glass bowl will do! Along with the water, add some cranberries, flowers or greenery to the vessel for an added pop of color and a unique look. Mason jars are all the rage right now and floating candles look amazing in them. I have just illuminated my mantle and tables with multiple mason jar candles. They really do give a very warm and cozy glow to any room. Put a handful of real cranberries in the glass, then fill the glass with water. When you do, the cranberries will float to the top. The look of the greenery with the red cranberries floating, and all in glimmering water, is elegant and perfect for your Holiday and New Year celebrations! 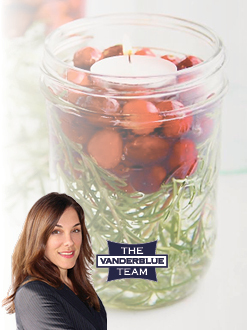 Your cranberry candle centerpieces will look spectacular during the holidays and really put you in the festive spirit. Your friends and family will be very impressed. Do replace berries when they become soft, which can range from a few days to about a week. Happy Holidays! Your home and tablescapes will be even more beautiful and festive with these cranberry candle centerpiece ideas. Enjoy! Caution: do not leave lit candles unattended!